Although I’m all about super simple, family-friendly meals, I honestly never thought I would post a recipe for Tatertot Casserole here on my blog. My memory is sitting at the kitchen table LONG after everyone else was finished eating, and long after my mom had cleaned up the entire kitchen because I absolutely refused to eat the one tatertot on my plate. For some reason, I didn’t like tatertots growing up… so my mom always left a portion of the casserole “tatertot-free” for me, with the stipulation that I had to eat at least one tatertot. I loved the casserole but it was always a big fuss to get me to eat that one tatertot… I suppose Nora’s stubbornness and strong will isn’t completely by accident! 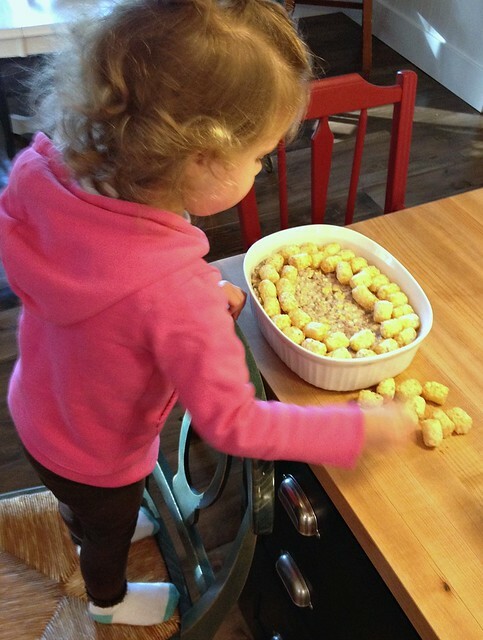 And speaking of Nora, this is one of her favorite meals — not only because she loves eating it, but also because she loves helping me put the “tater dots” on the top. She always has a new and creative pattern or design she wants to make, and loves helping me in the kitchen. If you’re looking for a quick, simple, budget-friendly, weeknight recipe that will please your whole crew, I’ve got you covered. In a large bowl, mix soup, milk, garlic, and onion. 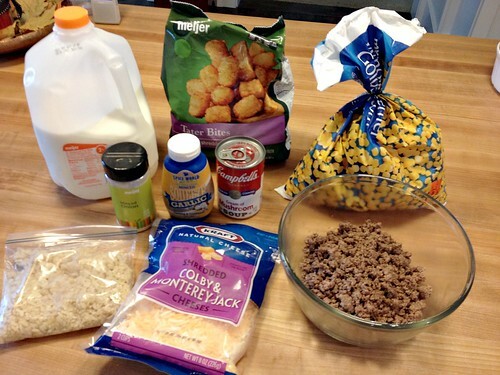 Add in cooked ground beef, corn, cheese, and rice. Stir until well combined. 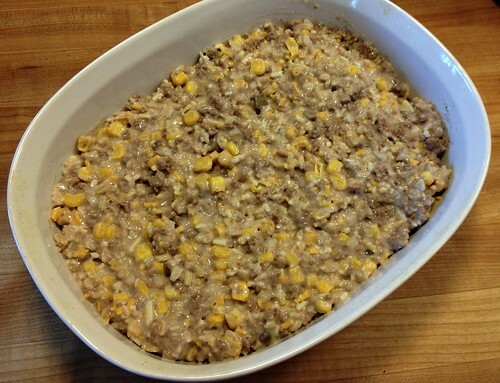 Dump mixture into a greased casserole dish (a 9″ x 9″ dish works well). 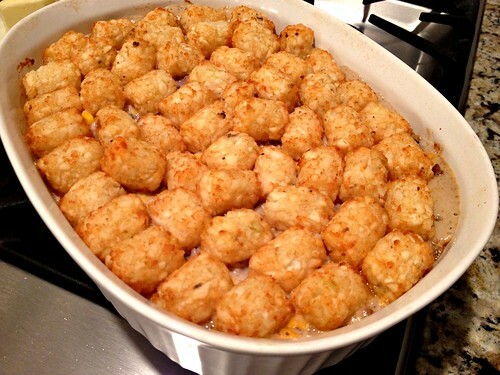 Top with a single layer of tatertots. Bake for 30 minutes or until tatertots are browned and casserole is heated through. I usually serve this with my homemade applesauce and fresh bread or rolls (simple, but we really don’t need anything else to go with it). Another thing I love about this recipe is that you can make this meal earlier in the day, or even the night before to save time. 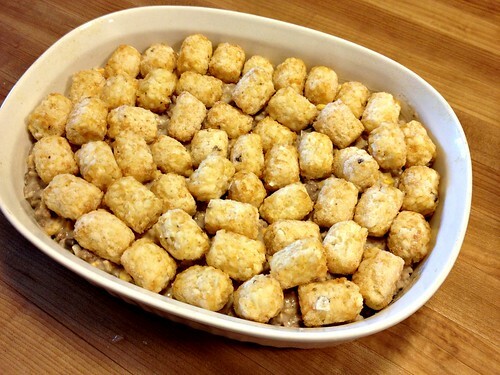 You can even freeze it before you bake it (either with or without the tatatetots on top). This is one of those meals I can have on the table in less than an hour (including browning the meat and the 30 minute cook time). Of course, if you have containers of browned ground beef in the freezer like I usually do, that will cut even more time off this recipe! 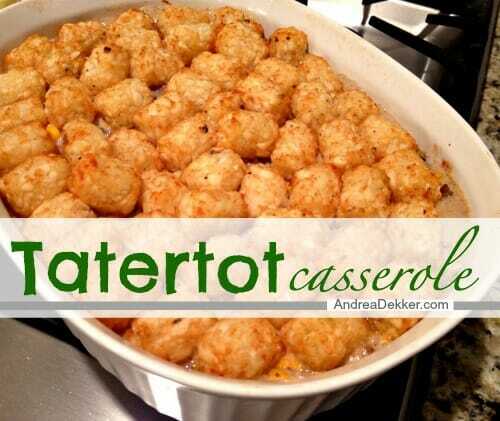 So there you have it, my version of Tatertot Casserole! There are literally hundreds of different recipe variations — if you’re looking for something a little bit different, just do a quick search on Pinterest or AllRecipes.com — you’re sure to find a variation you love! What are your family’s favorite casseroles? 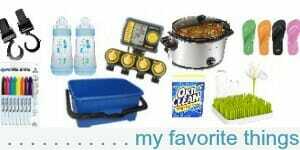 I am amazed at all the different options to this ‘Go To ” hot dish..Our church is having this for next weeks Weds. nite supper and I am a part of the preparing process.We are doing it with corn (had some frozen from a previous dinner).It goes over really well with kids and adults.We also serve it with applesauce and dinner rolls.Pumpkin Bars for dessert.Always good when it is cold outside. (P.S.I get my tatortots at Wallmart…..cheap and come in a huge bag. I made this last night and 3 out of 4 of us gave it a thumbs up. The 4th is our picky kid so I wasn’t surprised. I did 1/2 green beans cut small and 1/2 corn. My teen had seconds so I know he liked it a lot. Thanks for the simple easy recipe. My mom made this when I was growing up. I always hated it. 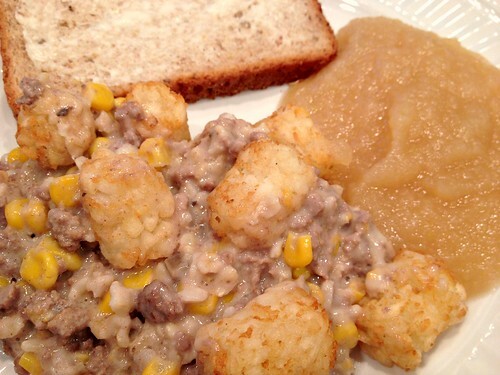 Then, after I had a baby, somebody brought tator tot casserole to me. I found it to be seriously delicious. Not sure if my taste buds changed or I was just so grateful I didn’t have to cook! 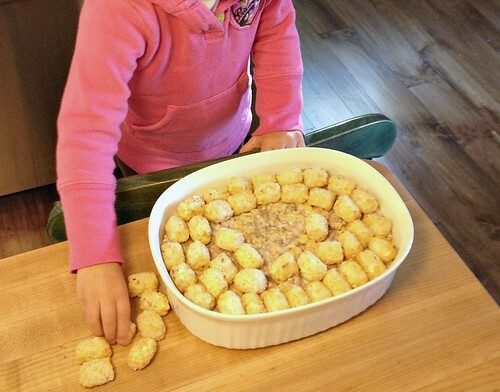 Our friend makes cheesy potatoes (the standard recipe of cream of chicken soup, sour cream, butter, cheese) with tator tots instead of shredded or cubed frozen potatoes. 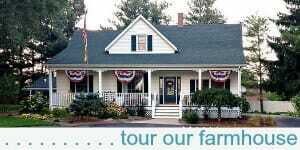 My goodness, it gets rave reviews whenever we make it. Wow — that does sound delicious! Can’t wait to try this one, Andrea! All of your recipes I’ve tried have been awesome! LOVE the Nora stories. Tater dots is adorable. Thanks Melissa — hope you love it as much as we do! 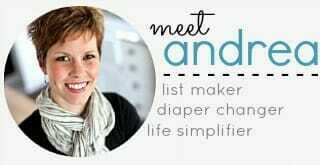 Can’t wait to try this one, Andrea! All of your recipes I’ve tried have been awesome! 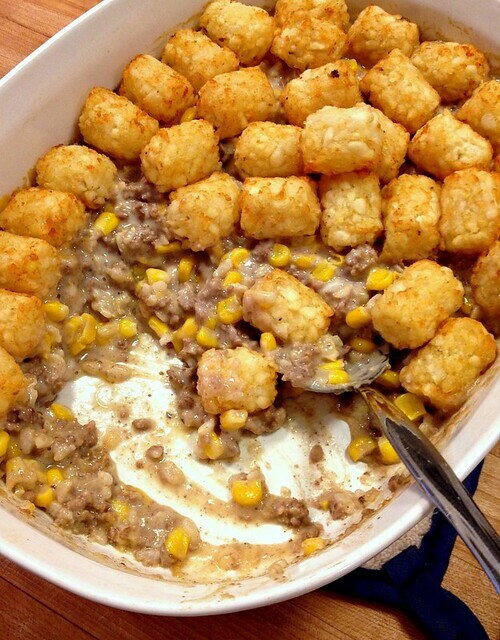 My least favorite casserole ever. That being said, change it up a bit and take out the milk, use golden onion soup, and add crumbled bacon. Oh and no cheese either. No corn but beans. Completely changes the taste! I also bake my tator tots halfway or so first so that they are super crispy. Good tip for the tator tots! Thanks! On another note-made your Apple Zucchini Bread yesterday and it was delicious! This was a favorite of the customers when I worked at a grocery store deli. We made it with green beans instead of corn and a lot more cheese! I think its a guilty pleasure and everyone loves it! I know lots of people who do the green beans instead of corn. I don’t know why — I’ve just always been a “corn girl”! Well how ’bout this for good timing! I was planning on using up that bag of tator tots from the freezer today so now I will improve on that with this tasty idea. Thanks. yay — hope it turned out OK!